The report provides an overview for each person and their achievements and thinking that led to their inclusion. Also, the results of a survey of intriguing global questions asked and responded to by the majority of the recipients is a must read. Additionally, a book list of the top 20 books recommended by the Top Thinkers is a great resource for all readers of the article (Fault Lines by Raghuram Rajan is the # 1 recommended book). While creating a list of this sort is inherently difficult and always ripe for criticism, Foreign Policy is a reputable publication that has the credentials to offer such a list to the public at large. Given that, I do believe it is worth learning more about all of those listed, many whom I’m not familiar with. While those included are all reputable and worthy of inclusion, some notable exclusions per conventional wisdom are Facebook founder and CEO Mark Zuckerberg, Time Magazine’s Person of the Year for 2010, and Julian Assange, founder of WikiLeaks; like him or dislike him; the driver of unparalleled international discussion about journalistic standards. 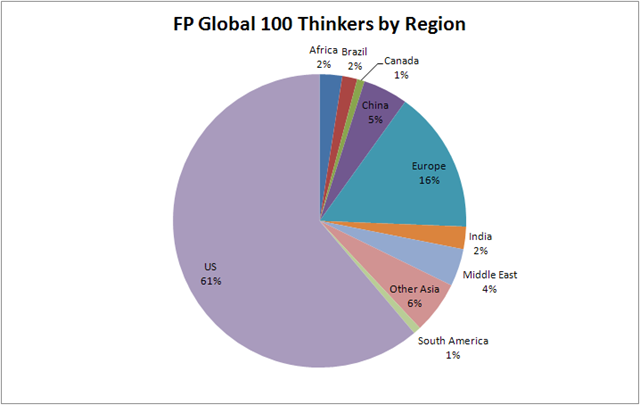 (Note: there are actually more than 100 individuals on the list, in a few instances, FP has grouped 2 or more individuals into a single slot in the Top 100 for working together on a single project or having independent, but similar impact on a particular topic—there were 121 individuals in their Top 100 list). The regional mix was heavily dominated by traditional Western powers US and Europe at 77% of the list; the emerging BRIC powers (Brazil, Russia, India, China) represented 9% of the list. 61% of the list were located in the US, followed by Europe at 16% . China came in at 5% and India at 2%. You’d expect those regions to have an increasing % of the list in the coming years, while Europe and US would have a declining %. The functional mix was much more distributed than the regional mix with Political figures representing the most common role at 27%. I considered anyone who was working in a government role for any country in the Political category, whether they were focused on internal or foreign affairs issues for their country. At 19%, the large amount of Economics related members of the list illustrate the ongoing economic turmoil and change in the world and the continued dialogue to make sense of this turmoil and how to improve the economy. At 15%, the high proportion of Activists relate to recognition of non-government people who are trying to improve the world in areas such as poverty, human rights, governance, through non-profit or independent organizations. Below you’ll see the full list of the Top 100, led by the amazing philanthropy of Bill Gates and Warren Buffett. 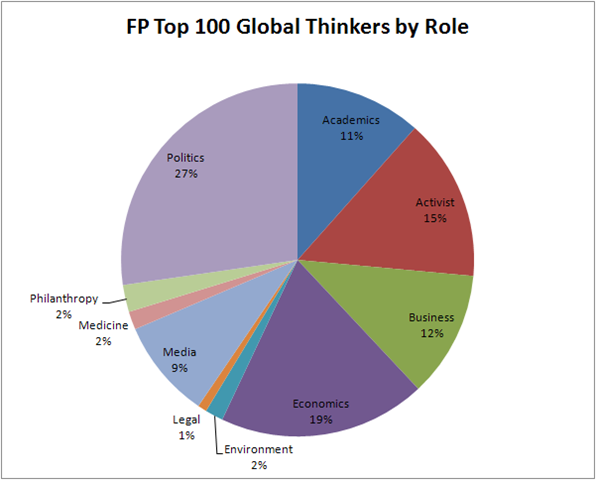 Links to each of the global thinkers Wikipedia page is included to learn more about them, plus the link at the beginning of this post has the link to the Foreign Policy article where you can flip through each members page to read more about their accomplishments. for stepping up as the world’s states falter. Chairman, Berkshire Hathaway | Omaha, Neb. for steely vision at a moment of crisis. for charting a course through criticism. for holding the world’s economic fate in his hands. for owning the U.S. economy, no matter what it takes. for transforming Brazil into a global player. for being the brains behind Turkey’s global reawakening. for taking a demotion to save a war. for transforming U.S. military might for the 21st century. for leading Europe through the recession with Teutonic resolve. for reminding a divided country that Muslims are Americans too. for seeing the roots of the next crisis in the current one. for his dogged efforts to keep America innovating. for proving it’s not what you make that counts — it’s who you give it to. for bearing the flame of 1989 into a new generation. CEO, Apple | Cupertino, Calif.
for dragging India out of its global nonalignment. for inspiring the thinking man’s Tea Party. for proving that there are second acts in public life. for standing up to China’s bullying. Co-founders, Google | Mountain View, Calif.
for pushing France on fiscal discipline. for bringing faith in technocracy to the Holy Land. for putting the spotlight on America’s debt binge. for showing that if wise men can give up on nukes, so can the rest of us. Elder statesmen | New York, Washington, Palo Alto, Calif.
for their spirited debate over the roots of the global financial meltdown. Economist, Princeton University | Princeton, N.J.
for chronicling the rise of the rest. for driving to make electric cars a reality. CEO, Better Place | Palo Alto, Calif.
for showing that natural resources don’t have to be a curse. for his full-throated defense of fiscal stimulus. for showing what the new politics of austerity really mean. for trying to inspire a new Greatest Generation. for being the adults on Capitol Hill. for showing the world what to do, and what not to do, in Haiti. for applying a stateswoman’s vision to gender equality. for dishing out the economic advice no one wants to hear. for putting hard numbers to a bleeding-heart pursuit. Economist, MIT | Cambridge, Mass. for putting a face — his own — on the peril of climate change. for driving a stake through the dark heart of Iran’s theocracy. for keeping the spirit of the Green Movement alive. for helping the world breathe easier. for proving that India can be not only democratic, but efficient. for trying to keep China’s rise peaceful. for reminding us just how bad things could get. CEO, Pimco | Newport Beach, Calif.
for forging a code of ethics to fit a globalized world. Philosopher, Princeton University | Princeton, N.J.
for not letting a crisis go to waste. for bringing economics (and economists) down to earth. Economist, Yale University | New Haven, Conn.
for keeping the West honest about its plight. for keeping the focus on governance, not just guns. for being the world’s eyes and ears in one of its most volatile regions. for holding Africa to high standards. for seeing Africa as the land of opportunity. for developing the world’s quickest shortcut to economic development. Economist, Stanford University | Palo Alto, Calif.
for making a business model out of solving the world’s big problems. for bringing behavioral economics out of the ivory tower. Economist, Harvard University | Cambridge, Mass. for teaching us how to crowdsource emergency relief. for articulating how China can become more than the world’s factory floor. for her staunch defense of Western values. for remaining convinced Islam can make peace with the West. for betting that green technology can be profitable. Venture capitalist | Menlo Park, Calif.
for depicting the realities of tyranny — so as to end it. for questioning whether we’re going after climate change right. for showing that poverty is about more than money. for encouraging the world to use its “cognitive surplus” for good. for seeing that we’re getting smarter. Psychologist, Harvard University | Cambridge, Mass. for envisioning the future of warfare. Military theorist, Naval Postgraduate School | Monterey, Calif.
for putting the world on notice. for giving us the tools to make sense of an information-addled world. for seeing the financial future in the past. Economist, University of Maryland | College Park, Md. for setting the tone of how the United States engages with the world. for never giving up on democracy. for scary prescience about the great threat of our time — again. for understanding that poverty and disease can’t be fought separately. for explaining the connection between planet and plate. for making the best of Greece’s worst year. for showing that economic crises are about a lot more than the economy. Historian, Harvard University | Cambridge, Mass. for showing us how small our online worlds are — and how big they can be. Founder, Global Voices | Lanesborough, Mass. for enlarging the space for debate in China. for proving that social networks are more than tweets and pokes. for doing the world’s dirty work. for moving her country away from a troubled past. for channeling rising China’s restlessness. for championing education in the Arab world. for showing that freedom is about more than markets. for using fiction to tell the truth about Israel’s open wounds. for reminding us what we lose in the rush for global competitiveness. for affirming the moral necessity of art, even in the worst of circumstances. for being the voice of a new Asian century. for embodying an independent-minded Afghanistan. for telling Europe what it doesn’t want to hear. for sounding the alarm about American radicalism. Historian, Yale University | New Haven, Conn.
for proving that the rule of law can be a force for change. for teaching America how to be a hegemon on the cheap. for combating every sort of inequality. for insisting that liberalism is more than a fighting faith. well done at writing this article on the special issue from FP! I like to translate into graphs and found everything I needed in your article. It will help me line up discussion topics for my Chinese club. I will use the top book list, percentage of top global thinkers per nationality and per role to discuss contemporary trends in China.